Get your CME certification in this series of fast-paced, cme online courses. Our courses will provide you relevant, timely continuing medical education, approved for AMA PRA Category 1 Credit(s)™. We invite you to review our CME online courses offered. You may also view our esteemed list of professionals who have participated in producing this course material. Due to the need for medical CME credits, CME Certification is a valuable part of your continuing education. 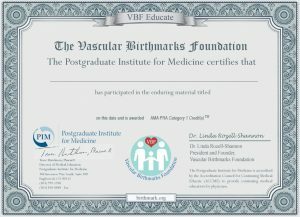 Our informative courses are jointly provided by the Postgraduate Institute for Medicine and the Vascular Birthmarks Foundation. The Vascular Birthmarks Foundation helps families affected by a vascular birthmark, tumor, or syndrome. Importantly, it links these families to the appropriate medical professionals for evaluation and/or treatment, and also provides informational resources. VBF sponsors physician education and mobilizes medical missions trips. It also supports research and programs that promote acceptance for individuals with birthmarks. It’s because of our mission that we offer this CME certification to physicians to help with the diagnosis and treatment of these related conditions. It’s easy to register and take the courses at your own pace. Please contact us if you have any questions. Earn CME medical credits with immediate access to your certificate in PDF format once the course is passed with at least a 70% score, and a short course evaluation has been submitted. All courses have been approved for the AMA PRA Category 1 Credit(s)™ and range from 3 to 16 hours.